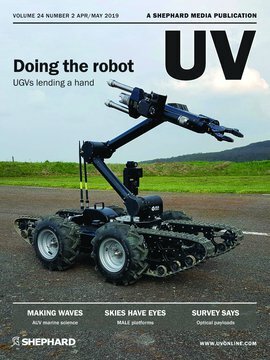 UV (Unmanned Vehicles) is the leading publication for the unmanned systems industry and a must read for the aerial, ground and maritime unmanned systems communities. UV provides an in-depth analysis of the industry’s leading players and the continually expanding use cases of unmanned systems. Here you can find all the news, analysis and detailed features of the defence uses of unmanned systems and the recent developments of unmanned technology and automation across the commercial and private sectors. The publication has a global print/digital readership of over 45.500, and is read by system and payload manufacturers, turnkey operators, financiers, as well as military, government and industry decision-makers.